20" x 24" 13" x 16"
"Red Willow Country" "Indian Summer"
20” x 24" Oil 14" x 16"
"Navajo Land" "Very Early Spring"
12" x 14" 16" x 20"
"Late Fall, Taos Pueblo Rider" "Ranchos Church"
12" x 16" 16" x 20"
"Portrait of Mother & Child" "TaosPuebloMan"
"Portrait of McMullen the Guide" "Abiquiu Cliffs"
"Going to Taos" "Gathering Pinon"
"Green and Gold" "Hillside Corrals"
"Mountain Bighorn" "NM Mountain with Adobe"
"Pueblo Maiden" "Pueblo Rider White Horse"
"Purple and Gold Mountains" "Pueblo Rider"
"Red Willow Valley" "River Bend"
"Fall On The Rio Grande" "Early Pueblo Rider Brown Horse"
"It was so different then," McAfee said of Taos. 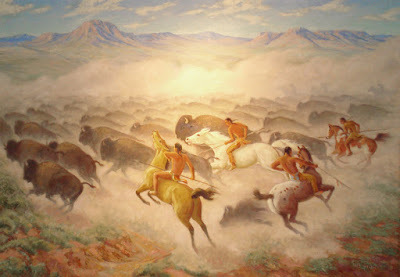 "The village was small and the Indians remained uninfluenced by the invaders. Once I asked one of them, ‘What did you call this country before the Europeans came?’ ‘Ours,’ he told me." It was 1926 and the new Ford convertible pulled into Taos after a long trek through Colorado mountain passes. Artists Ila McAfee and her husband Elmer Turner were on a honeymoon journey that would ultimately take them to California to complete a mural commission. 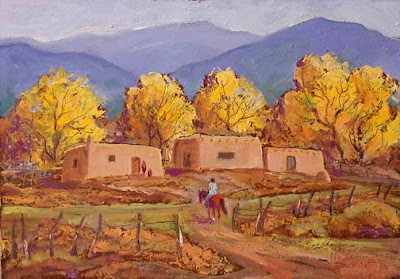 When they arrived in Taos McAfee and Turner were captivated, not only by the vibrant scenic beauty and intriguing local culture, but also the sophistication of the artists who had settled here. 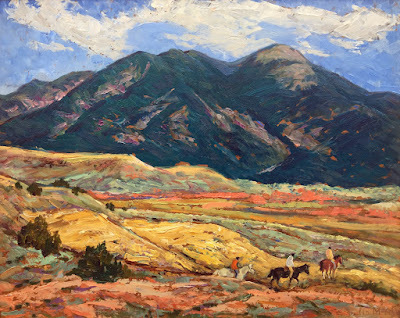 The first person they met was the Russian-born artist Leon Gaspard, painting in a field on the north side of town. 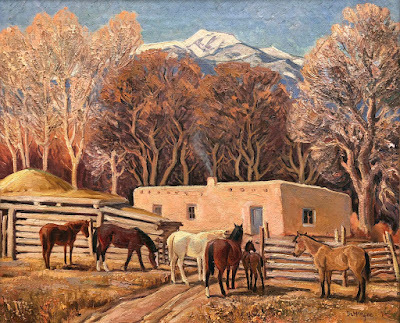 They then sought out and introduced themselves to some members of the Taos Society of Artists -- Blumenschein, Berninghaus, Ufer, Hennings and Higgins. 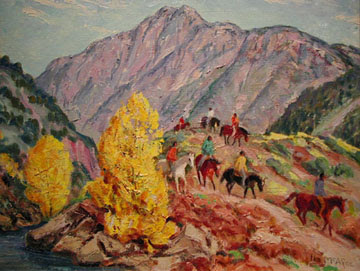 Their own extensive art training and ambitions responded to this stimulation, prompting them two years later to make Taos their permanent home. "It was so different then." Mcafee once explained. "There was nothing between me and the mountain when we first got here. The village was small and the Indians remained uninfluenced by the invaders. Once I asked one of them, ‘What did you call this country before the Europeans came?’ ‘Ours,’ he told me." Within a year McAfee and Turner began construction on their new home -- The White Horse Studio -- on what was then an alfalfa field and now is Civic Plaza Drive. "There was nothing between me and the mountain when we first got here," McAfee nostalgically recalled. 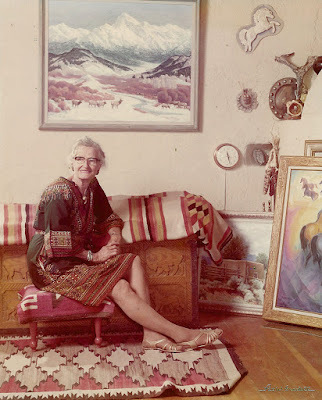 She lovingly decorated their 'pueblo-revival' adobe home and studio with traditional hand-carvings: on mirror frames, pine chests, display cases and furniture. What makes Ila McAfee's story unique is not her romantic escape from Eastern academicism or urban decadence, but her re-discovery and affirmation of an identity that was primarily and joyously Western. 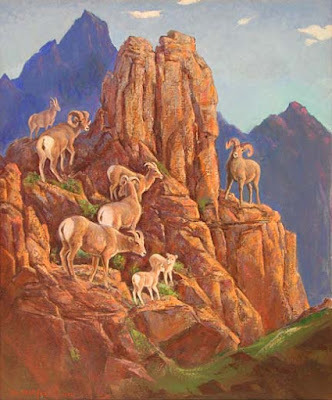 Like Charlie Russell -- whose work she admired -- McAfee was one of the first truly western-born artists, and her rich, imaginative body of work documents the land, its wildlife and its people from a perspective of intimacy. 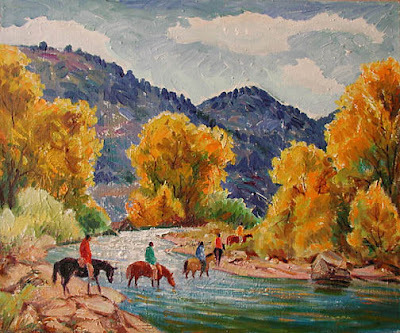 Born near Gunnison, Colorado, in 1897, McAfee grew up on a ranch and rode her horse to school. "Spending two or more hours on a horse every day I became pretty well acquainted with them," she remarked. 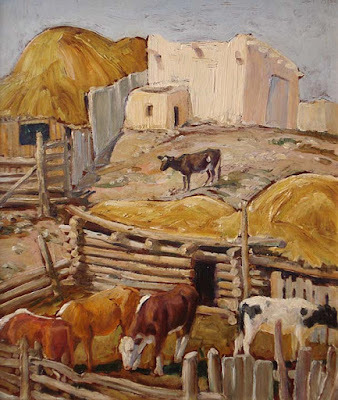 And in fact the rural life McAfee knew as a child gave her the opportunity to amply absorb and observe the richness of nature that later she so effortlessly incorporated into her art. At an early age she began to draw-on old envelopes, boxes and books. 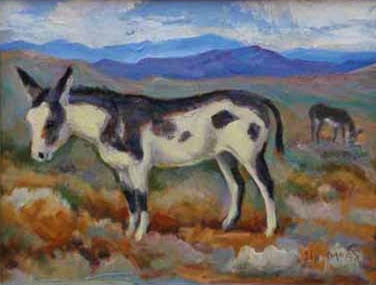 Paper was scarce and her first full image of a horse was drawn in a copy of the family Bible. 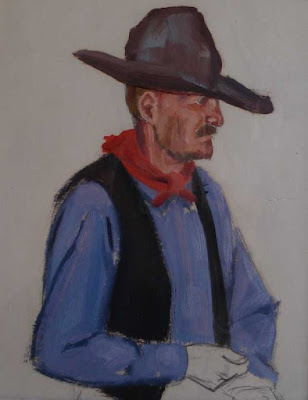 This subject matter, one that so dominantly and characteristically represented 'western', became McAfee's totem. Throughout her life she would continue to explore its vitality and beauty relentlessly, in a myriad of styles and moods, executing primarily from the standpoint of memory. "I just imagine them," she once disclosed, as if their being existed in a mythological realm. 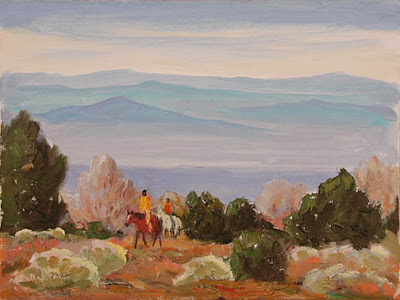 From the beginning McAfee pursued her artistic goals with clarity and determination. She graduated from high school and continued her art education in Los Angeles at the West Lake School of Art and then the Hay Art School. 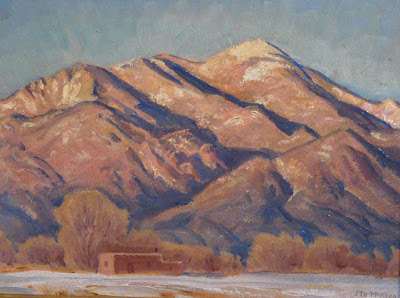 Returning to Colorado she attended Western State College in Gunnison where she studied with Catherine and Henry Ricter. After graduating from Western State with a Bachelor of Arts degree McAfee went on to the Art Institute of Chicago. There she studied and worked under the tutelage of Lorado Taft, a noted sculptor, and muralist James McBurney, whose assistant she eventually became. After some years she moved to New York City and attended the Art Students League and the National Academy of Design. 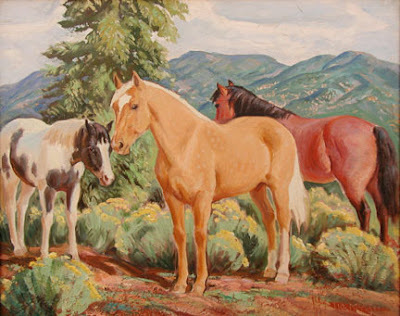 While in New York McAfee also worked as an illustrator and painted portraits of horses for wealthy owners and breeders. It was during this period that she began receiving her first commissions for murals. But while McAfee must have found pleasure in these successes one imagines that the emotional pull of the west continued to exert a profound influence. 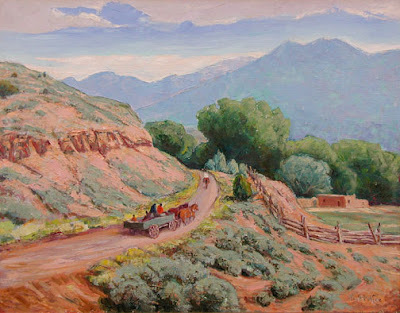 While in Chicago McAfee had met and married fellow art student Elmer Turner, who also happened to be from Colorado. So when the pair decided where they wanted to pursue their artistic careers it was the west to which they returned, and found lifelong inspiration. 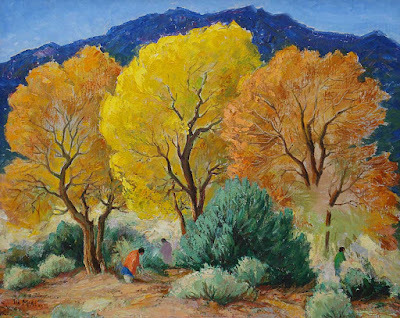 Once settled in Taos there is little doubt that the thriving artistic life of the community, suffused with new ideas of modernism, had its impact on McAfee's work. In the evening local artists, including Turner and McAfee, would gather at The Don Fernando Hotel and energetically discuss ideas and talk shop. 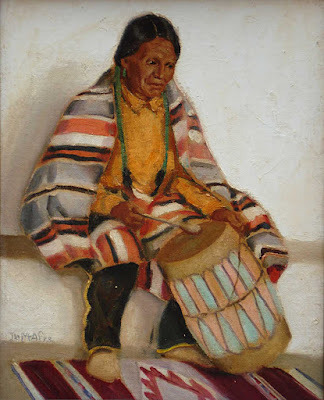 Like the work of many artists in Taos at the time, bold and experimental coloration and composition began to appear in McAfee's paintings as explorations of geometric form and the use of process as a vehicle for expressive vision. "I spend more time looking at the painting in progress than I do actually painting. I work out the composition and let the painting flow from there," she observed. McAfee delighted in executing rapidly, playing with abstract form, sometimes letting pigments and their random patterns determine the dynamic movement of a piece. She and Turner often painted together, and Turner's modernist brushwork and use of color can often be glimpsed in his wife's early work. 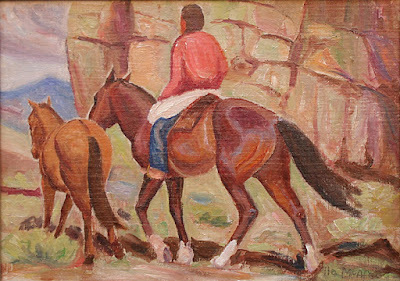 But Elmer Turner's career was prematurely ended by illness -- a neurological condition that left him unable to paint. Ila devotedly cared for Turner for many years until his death in 1966. 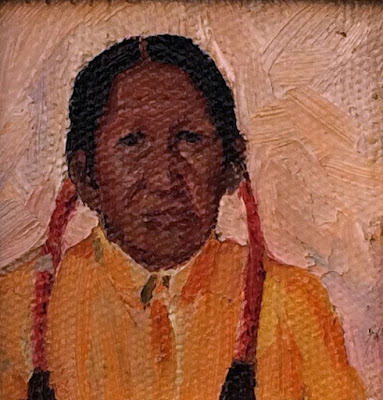 During this difficult time she continued to paint, continued to seek solace and strength from her work, to explore and deepen her individualism. 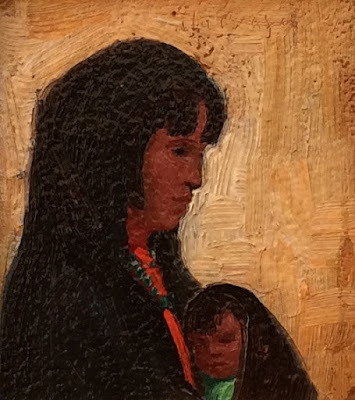 It is in her important later works that McAfee achieved her most authentic voice -- through the execution of a mature and fully developed style. In contrast to her earlier exuberant and experimental bent, the style became classic, controlled, contained. The mood that emanates from this art is contemplative, essentially conservative -- it treasures what is recurring and eternal in nature and in the human spirit. 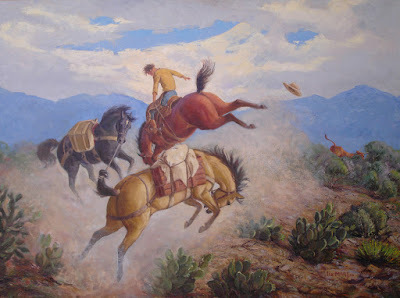 The themes are those of tranquility and recollection -- horses pausing to drink, Indian riders quietly crossing a stream, horses toiling uphill pulling a wagon to bring weary travelers home. And color is completely unified with subject matter. This achievement is palpable in Red Willow Valley, where cool blue and white tones stand in perfect counterpoint with warm, rusty browns and reds to create a sense of stately repose that captures the essence of what is sublime in nature. 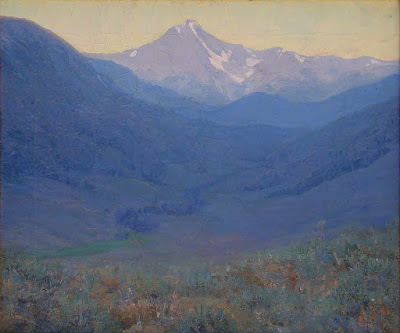 In other pieces, such as Early Morning Shadows, the complex compositional richness reiterated by saturated color invests the humble scene with deep emotional resonance. 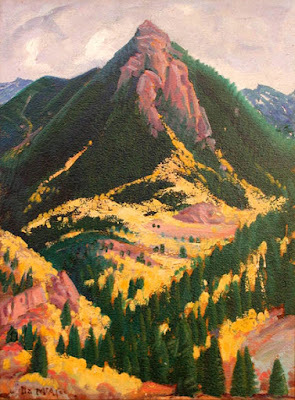 By artistic synthesis McAfee laid claim in an exceptional way to the landscape she had known since childhood. She was distinctive and very much a Westerner. Her long, prolific career exemplifies the trajectory of American art at that time, which was one of moving towards self-discovery, confidence and the delineation of an American aesthetic that embraced American themes. Few accomplished this with more authenticity than Ila McAfee. 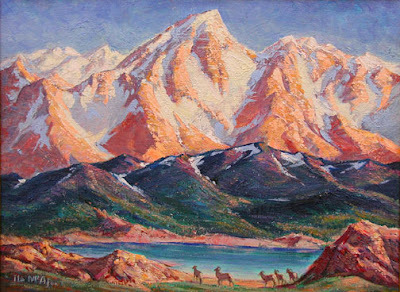 Ila was born 1897 in Sargents near Gunnison in southwestern Colorado. She loved horses, and began to draw them in her early youth. She rode her horse to attended Logan County School. In 1916, she finished Gunnison High School. 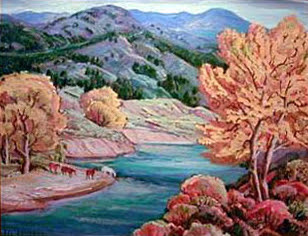 In 1917 - 1918 she attended the West Lake School of Art and the Haz Art School in Los Angels. in 1919 she earned a BA degree at Western State College. In 1920 she traveled to Chicago and was a student of muralist James E McBurney, serving as his assistant until 1924. In 1925, Ila was a student at the National Academy of Design in New York. 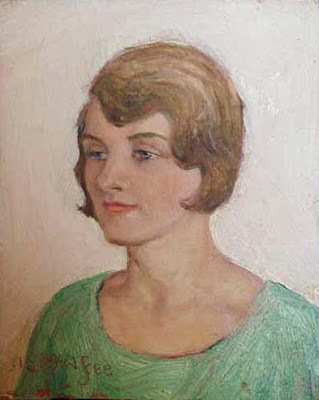 In 1926 she studied with the Art Students League. 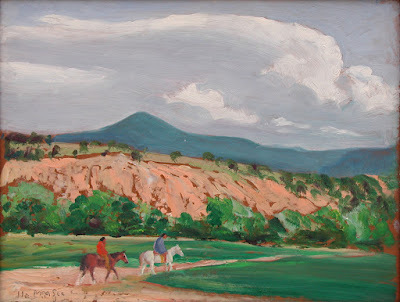 In 1926 Ila married Elmer Page Turner, and visited Taos, New Mexico. 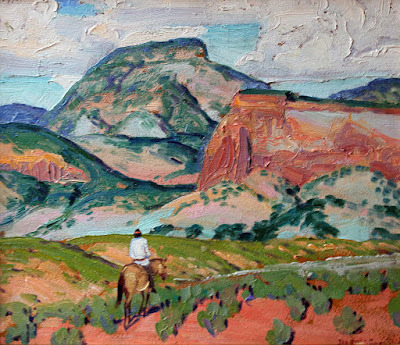 In 1928 she and Elmer settled in Taos. In 1929 she and her husband built the White Horse Studio. 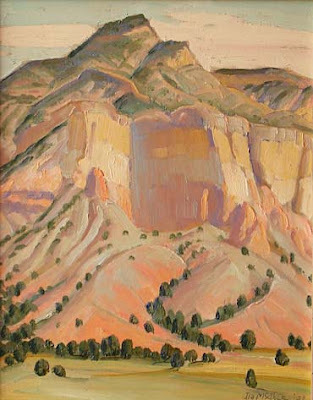 In 1933 the couple moved to Pueblo Colorado. 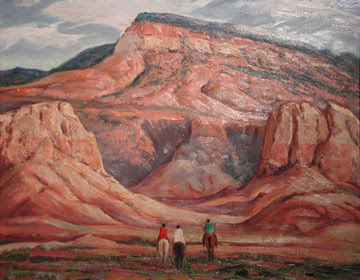 During this time she worked as a WPA artist, making many works for Post Offices, including Edmond, Oklahoma, and Clifton, Texas. In 1981, she was awarded as Taos Artist of the Year. 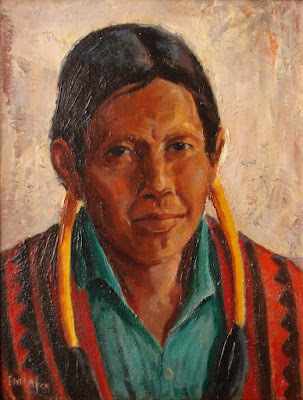 Ila died in Pueblo Colorado in 1995 at the age of 97. 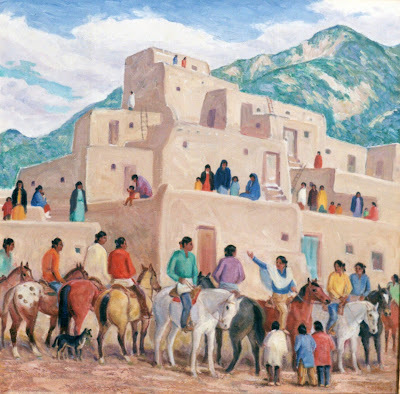 "At the Crossing, New Mexico"
Parsons does not offer Ila Mae McAfee prints, because no print can compare to the real paintings.